Learn more about the top reasons commercial buildings fail safety inspections to ensure your building is up to code. Safety inspections are crucial for all commercial buildings, especially inspections and testing of fire protection equipment. 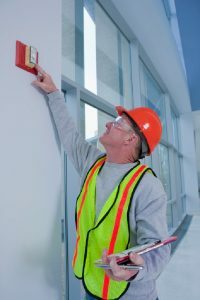 If your building’s emergency lights aren’t working properly or if your fire extinguishers are expired, you will not only fail the safety inspection, but you are putting all occupants and employees in danger. Continue reading to learn about the top reasons commercial buildings fail safety inspections to ensure your building is up to code. The exit doors are difficult to open from the inside. All exit doors must be easily accessible in the event of an emergency for occupants to exit the building safely. The stairways, pathways, and/or walkways are obstructed. Emergency lights and exit signs aren’t working properly. Electrical outlets, circuit breakers panels, and junction boxes aren’t covered. Electrical fires are one of the most common causes of commercial building fires, so it’s crucial to ensure all outlets are covered. The use of extension cords for a permanent solution rather than temporary purposes. There are no fire extinguishers in the building. Also, if there are fire extinguishers, but they are hidden, expired, or not working. The sprinkler system hasn’t been serviced properly by a licensed fire protection official at least once a year. Hazardous materials aren’t properly stored or are stored without the proper permits. The building’s fire alarm system hasn’t been tested and serviced annually by a licensed fire alarm company. The area around the outside of the building is full of high grass, weeds, trash, or debris. The United States Department of Labor states that over 40 percent of all companies that experience a disaster, including a building fire, never reopen. Regular testing of your fire protection equipment and safety inspections provides the peace of mind you need to operate your business securely and efficiently. At Fireline, we have over 150 technicians trained and experienced in testing all types of fire protection systems and offer complete inspection and testing services for your commercial building. This entry was posted on Wednesday, June 6th, 2018 at 4:11 pm. Both comments and pings are currently closed.